Eternal Haunted Summer: If you could correct one common misconception about modern Paganism (or polytheism), what would it be? Anne Welch: A misconception many Pagans have with my beliefs is that so many only go with archeology, ignoring folklore, cultural changes, and linguistics. Arta means ‘she-bear,’ and it is the root [word] for many other bear deities. Having the mind to tell me “I’m wrong,” is not in the spirit of open-mindedness so many communities claim to have. EHS: How did you first encounter Arta? AW: I was on the Rhine River, near the foothills of the Alps when I became extremely light-headed and fell over. I saw her, wearing the rough furs of bears adorned with copper ornaments and jewelry. In her left hand was a long handled short-faced maul, and in the right was a long handled axe. Beside her, to her left, was a long crooked and partially burnt staff, and in front of her was a large bowl that never ran empty. I saw her standing away from the crowd, but she saw me through everyone. I got up with the memory of Arta entrenched ever since. I was thirteen. EHS: You have stated that Arta is not the “typical Woodland Goddess.” Could you expand on that? AW: There is so much more to the memory of bears than honey, the woods, and war. Granted, they are part of Arta, but she is so much more. The memory of metalwork, the underworld, healing, magic, and more is still there. I think the reason not much more has been learned is due to the lack of popularity of the Bear Goddess. Not to mention that Brighid herself has the title of ‘daughter of the bear.’ I have read in many places her name can be traced back to that of the bear, but that research is still on-going. The very act of mining into the earth (and consequently the underworld) is the place you can find the Bear Goddess. Makes sense to me, and this entire book is my own personal path with her. Also to quote from The Contiuum Encyclopedia of Animal Symbolism In Art, written by Hope B. Werness, “In Neolithic cultures, and possibly earlier, the Great Goddess’ creativity extends beyond procreation and to the crafts. Inventor and patroness, the Great Goddess was associated with metallurgy, spinning, weaving, and music.” The bear was one of the main symbols for this personna. Though I do not believe in any ‘one’ singular great Goddess, I do think the Bear Goddess to be one of the many that there is. I do not know of Arta as a blacksmith specifically, but a type of metalworker. Until I learn more and research becomes available, I’ll leave it at that. EHS: Why do you think the Bear Goddess is not as well-known as other Deities? AW: It isn’t the fad of the Pagan community right now, and probably never will be. No horns, no strangeness to attribute to her. Also the fact that so little has been researched about her: I had to look around at folklore, myths, and other bear ‘related’ deities to draw a coherent picture. It is hard work, and I do wonder at what has been lost or changed through history by human hands, what the whole picture really looked like in it’s original form. EHS: How do you honor Arta? Rituals? Prayer? Artwork? AW: I have two bear skulls. One represents water, the other fire, both of which are keenly connected to Arta. I have many deeply personal rituals, but the ones I’ve included in the book are a good start for this modern world. Artwork is unique for her. I have a wooden carved statue dedicated to her, as well as hand-crafted tools I use in my ritual work with her. I do not agree with buying tools if at all possible, as well as purchasing needed materials for ritual from a store: my faith is in Nature and Arta, and it is to the outdoors I go. My prayers are deeply personal, but I do my best to give a daily devotional to her if I am not pursuing a specific ritual need. I have prayer beads that contain a bear claw for the underworld, an antler for the middle world, and a bird claw for the upper world. EHS: What kind of information is available about bears, bear worship and Bear Goddesses in pre-Christian Europe? AW: Actually there isn’t much information available in one place; snippets and references at the most are scattered in a wide range of resources. It took time and digging to root out the information into a collective whole. But, the information I gathered probably will not fit into the ‘accepted’ mind-set people already have about bears and their deities. Another problem here is the limiting, categorizing, or the labeling of deities. But anyone familiar with Celtic deities is aware of the expansive range of their abilities and talents, and the overlapping many deities had with their neighboring compatriots. I have gathered together the information as best as I can, and I hope it is at the very least an interesting read. EHS: What resources (books, journals, websites, et cetera) would recommend to those who are interested in bear worship and Bear Deities? 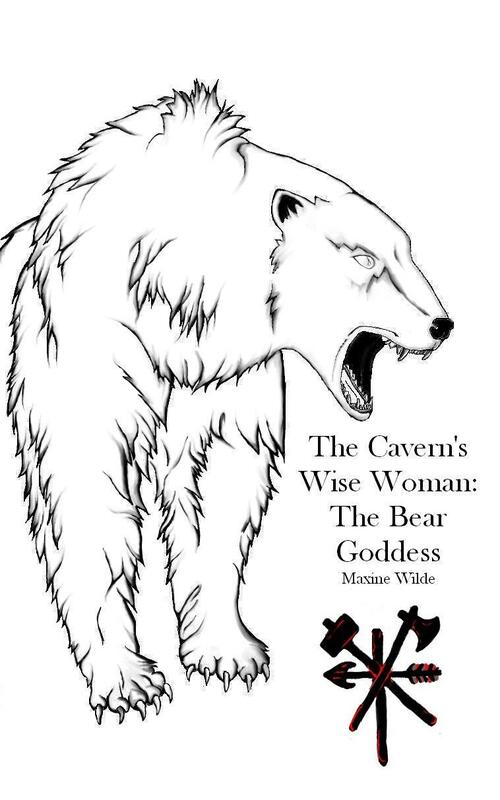 EHS: Why did you title your book The Cavern’s Wise Woman? AW: The title is about the underworld and the workings of Arta. Arta is a Goddess of ‘Encyclopedic knowledge,’ which fits well for an ancient Bear deity. Caverns have been used for ritual working for centuries, and some are still in use today for modern Paganism. It just made sense to me to title the book this way. EHS: Where can curious readers find your book? AW: It is being published by Spero Publishing. I’m still learning the publishing process, so bear with me. AW: Two other books about the other two deities I work with. The next book will be about the Antlered Goddess of the Middle World, the weaver of fate and guardian of the boundaries. The third one will contain the practice of the Bird God I work with, and the upper world workings. EHS: Which conventions, book fairs or other events will you be attending in the foreseeable future? AW: Whichever ones I am invited to. I’m no celebrity in the Pagan community, but I will go if I’m invited to one.